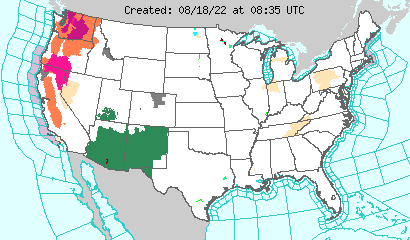 Background:The purpose of a weather map is to give a graphical or pictorial image of weather to a meteorologist. As a forecasting tool, weather maps allow a meteorologist to see what is happening in the atmosphere at virtually any location on earth. Complex three-dimensional models of weather systems can be made by collecting weather data at multiple levels in the atmosphere. Computers then compile that information to produce the pictures that weather scientists analyze. In the early days of meteorology, these pictures were all drawn by hand! That is a pretty long way of writing a simple math equation. In fact, you may already use a version of shorthand in your email and blog postings. For instance, using :) is a smile! But how do meteorologists use weather symbols? Click on a tutorial below to find out! Wind barbs are used to show wind intensity with a series of small pennants. The information for wind speed is always given in knots. All you have to do is add up the numbers on the wind barb and you get the wind speed. To get the wind direction, all you have to do is imagine a compass placed right over top the wind diagram or station model and it will point to the wind direction. 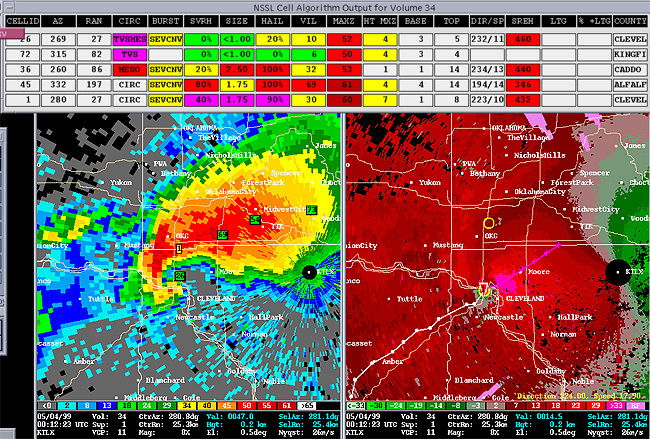 Radar intensity is a way to "see" through rain. A pulse of energy is beamed through a cloud and the amount of echo returned will give the intensity of precipitation. The echo is actually a reflection of the energy and a computer will generate a color code to indicate the amount of precipitation. When the radar echo reaches the precipitation, the larger the raindrops, or the more raindrops there are, the greater the DBZ value and the heavier the precipitation. When reporting rain to a local area, meteorologists need a universal way to indicate the conditions they observe. The weather map symbols for rain, snow, sleet, hail, and more can be seen in the diagram. These often do not show up on your evening news, but a meteorologist will use these to communicate the information nationally. Aviation is one area where understanding cloud types can help a plane to have a smoother flight. Clouds give pilots an indication of air motion, stability and moisture. These cloud types are reported using universal symbols that all aviators can understand. Often, the cloud symbols are also used on weather maps and cloud posters in educational settings as well. Can you learn them all? Go to the full cloud symbols chart to get individual pictures of what each cloud would look like in the sky. Weather Stations often report weather in a station model. The central part of a station model is the cloud cover. The amount of cloudiness reported to you during the evening news is indicated by a series of symbols. 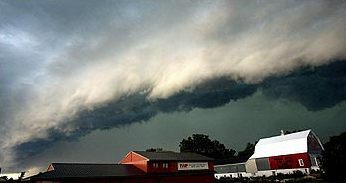 Weather fronts are the boundaries between air masses with different characteristics such as temperature, humidity, and air pressure. An air mass is a large parcel of air with roughly the same temperature, humidity, or pressure throughout. Different air masses tend not to mix. The clashing of two or more air masses is what causes severe storms. The front is literally the “front end” of an air mass. Movement of a front will depend largely on the conditions inside the air mass. Air masses tend to be either moist maritime or dry (continental) in humidity content. Temperatures are either cold (polar) or warm tropical. The weather map symbols used for fronts are indicated above. Go to the answers for the types of fronts pictured above.